Hello, there! In my last post I mentioned the apple kuchen that I made recently, so today I thought I'd share the recipe. Work these ingredients together until they form a soft dough, then pat the dough into a square baking dish. Build up the edges a little bit, so that they will hold in the filling. For the filling, mix 1/4 cup brown sugar and 1/4 teaspoon cinnamon or apple pie spice in a small bowl. Thinly slice two apples (peeled or not, your choice), dip each slice in the cinnamon sugar, and arrange the slices in rows on top of the shortbread crust. This mixture will be wet and sticky. Spread it over the rows of apples. Then bake the kuchen for 35-45 minutes at 350 degrees Fahrenheit. After the kuchen cools, cut it into squares. It looks a bit homely in the pan, but it still tastes good. Once I tried to make it look prettier by alternating slices of yellow and green apple and using white sugar instead of brown sugar in the crust. But I'm not sure whether that actually looks any prettier. In any case, kuchen does look nicer once individual slices are placed on serving plates. It's a triple delight: the shortbread-like bottom crust, the juicy apple layer, and the tender top crust. I have to smile about that last photo. I have been trying to cut down on my caffeine intake, so I'm limiting myself to two cups of coffee per day. The deprivation has been...challenging. On this day, I was so excited to get my daily coffee allotment that I drank half the cup before I remembered to snap a picture for the blog. 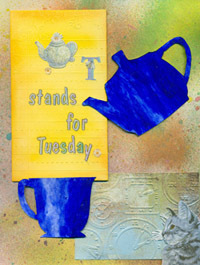 To find out what kinds of tea, coffee, and other drinks creative bloggers have been enjoying lately, do check out T Stands for Tuesday, the weekly online "tea party" that I am linking to today. Thank you for the recipe, Denise. I'm one who commented last week that I love kuchen but don't have a good recipe. No more excuses! That looks really yummy!! I'll have to save that for later! I am also going to try this recipe, because I had never heard of it before and was curious. I had to laugh as I was reading, I misread "when KITCHEN cools. . ." The second recipe is very pretty, but unless you are making it for a dinner party, I'm sure your husband and son will love it regardless of the beauty factor. I commend you. I could never just drink two cups of coffee a day, so I can see why you got excited enough to have your alloted cup. Thanks for sharing your kuchen recipe AND your coffee with us for T this Tuesday. The tray bakes look delicious. Thank you for the recipe. A piece with a cuppa sounds good to me. it will be the kuchen for next Weekend. I like recipes that aren't fussy to make. Your apple kuchen fits the bill perfectly. I had to laugh about forgetting to take a photo of food or beverage. Glad I'm not the only one. Have a Happy T Day! I will try it as well! Thank you for sharing - sounds and looks so yummie! Believe it or not, my version of the recipe has less sugar and fat than how my grandma used to make apple kuchen! But I agree with you, it is still a lot of sugar. Author: Minnesota writer Bao Phi. Phi is perhaps best known for his poetry, and this story--unusually for a zombie apocalypse story--has a lovely poetic quality. Found in: Octavia's Brood: Science Fiction Stories from Social Justice Movements. Storyline: This is a zombie story for the thinking person, and it revolves around topics like terrorism, racial profiling, and discrimination. You'll be rooting all the way for the main characters, two freedom fighters facing the monumental task of liberating prisoners who are being held as "zombie bait." Illustrations: The single illustration of a broken chain link sums up the story eloquently. John Jennings created this image, as well as the cover artwork. Found in: A book by the same name--The Paper Menagerie. This is a collection of short stories by Ken Liu.